Experimental 105 (copy of Aerostar S60A) ENVELOPE ONLY* Mfd. 1985. 130 hrs TT. Two- point suspension, steel cables. Velcro Rip Top. Side maneuvering Vent. Nylon Skirt. Fabric pulled to 45lbs at last annual. Some moderate to high porosity readings. 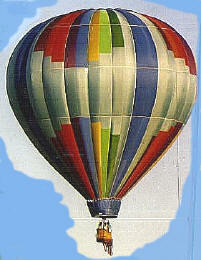 $3495.00 Price reduced $1500.00 Contact: Paul S. Stumpf (802) 875-1600 -or- psstumpf@aol.com Please mention Balloon Model and Total Time when e-mailing to request more info.